Billboard 1, 2018, digital print, H3050 x W6100mm. 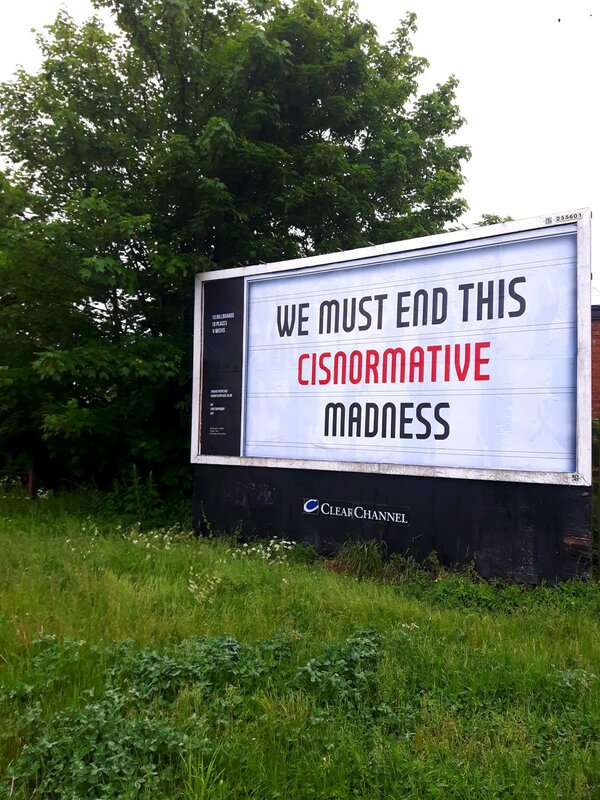 Stylistically linked to the artists Reader Board series, this work features the slogan ‘WE MUST END THIS CISNORMATIVE MADNESS’ digitally printed and displayed on a commercial advertising billboard. This slogan first appeared in Fox’s work as a centre page spread within his newspaper Stop The Press; created as a guide for ending transphobia within the UK media as part of the piece Newspaper Stand, 2018. The slogan was adapted from a transphobic article originally published by the Daily Express, repurposed here as a direct critique of this article and the wider issue of xenophobia within the UK media as a whole. Displaying this slogan as an advert on a billboard furthers this critique, posing questions around the lack of transgender representation within commercial advertising and the need to be more representative of gender variations outside of the cisnormative. Billboard I was commissioned by CVAN East Midlands as part of their region wide billboard project In Another Place, to coincide with A Manipulation of Terms at NN Contemporary Art.